The level switches model FS15 work according to the magnetic float principle. 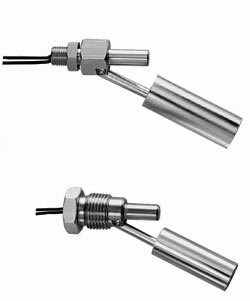 The float is lifted upwards by the rising liquid level in the tank until the magnetic field of the integrated permanent magnet activates a Reed contact. Depending on the way the level switch is mounted this contact may work as an N/O or an N/C switch. The float level switches FS15 are designed to monitor the level of nearly all liquids which do not affect the used materials, for example as HIGH- or LOW-alarms or for controlling valves and pumps.